1957: Legal Immigrants in Van Nuys. From the CSUN Digital Library. The parade was held at Christmas-time for many years. 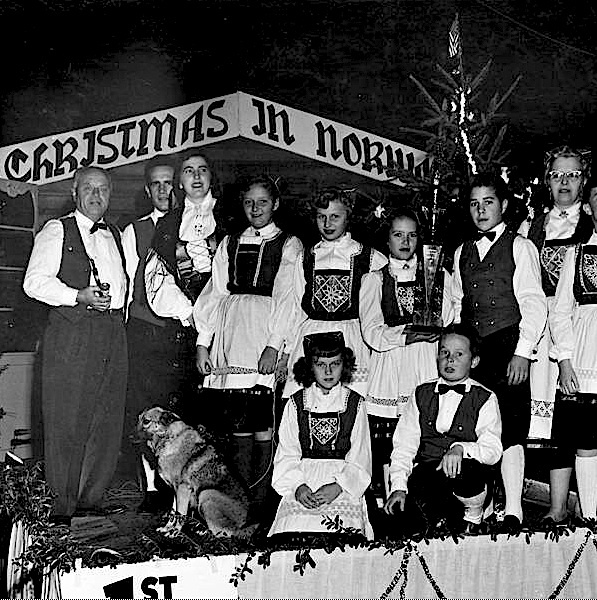 In 1957, the Norrona Lodge No. 50 won 1st place. Pictured here are Jake Olson, Ralph Rettledahl, Elsa Holmstraud, Pam Anderson, Janie Larson, Eileen Hill, Jan Riesser, Mildred Riesser, Jayne Applen, Lilah Mobraten, and Jan Seeger. Norway Hall is located at: 14312 Friar Street, Van Nuys, CA 91401. Phone: (818) 780-4778. I was at this parade in 1957–we used to go every year. There were celebrities and lots of floats depicting Biblical scenes. I can remember Lucille Ball in a white convertible Cadillac with the huge tail fins–a big glob of bright red hair going down VN Blvd.